This fateful day in 1066 is marked by the Battle of Hastings Commemorative Sheet. 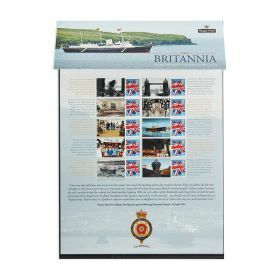 10 dramatic labels beside 10 1st Class English Country Definitive stamps map the background to the battle, the engagement itself, and the aftermath. 2016 marks the 950th Anniversary of the Battle of Hastings in which King Harold died and Duke William II of Normandy secured his claim to the English throne. This fateful day in 1066 is marked by the Battle of Hastings Commemorative Sheet. Edward The childless Edward the Confessor ruled England from 1042 to 1066. Harold, Earl of Wessex Harold Godwinson was the richest Earl in England, he claimed the crown on Edward's death. William William was the illegitimate son of Robert 1 of Normandy. An Omen in the Sky Halleys' comet appeared over England early in 1066. The Normans Descended from Vikings who had settled in France, many Norman knights were poor and were thirsty for conquests. The Anglo Saxons arrived in Britain from the fifth century. The lands they settled in became 'Angle-land' or England. Norman Landings Before the invasion William built up a vast war fleet of men, arms, provisions and horses. The fleet landed in England on 28 September 1066. The Battle began at about 9 a.m. on 14 October 1066. Death of Harold Harold was killed late in the afternoon. Bayeux Tapestry Commissioned not long after the Battle of Hastings. It tells the story of William's invasion and provides a unique insight into the customs, architecture and weaponry of the period.